SSL (Secure Sockets Layer) is the standard security technology for establishing an encrypted link between a web server and a browser. Ensuring comprehensive web security is a top priority for StoreHippo. With the aim to make secure and encrypted connections, StoreHippo provides SSL certificates. SSL certificate is used as a ranking signal in Google search ranking algorithms. In simpler terms, if your website switches from HTTP to HTTPS, by adding an SSL certificate you have a better chance of ranking higher on Google SERPs. It authenticates the identity of the website (this guarantees visitors that they’re not on a bogus site). It encrypts the data that is being transmitted. For example, if your store's URL is http://www.abc.com, it will be updated to https://www.abc.com after you activate SSL certificates, customers who use the original URL will be redirected to your encrypted store. Go to Settings > SSL Certificates section in StoreHippo Admin Panel to manage SSL of your domain. To add a new SSL, click on Add New button. As you click on Add New button, a new page will open up where you can provide the information regarding the SSL certificate. Enter the domain name on which you need your SSL to be active in the domain field. This is free of cost & StoreHippo will take care of its renewal. 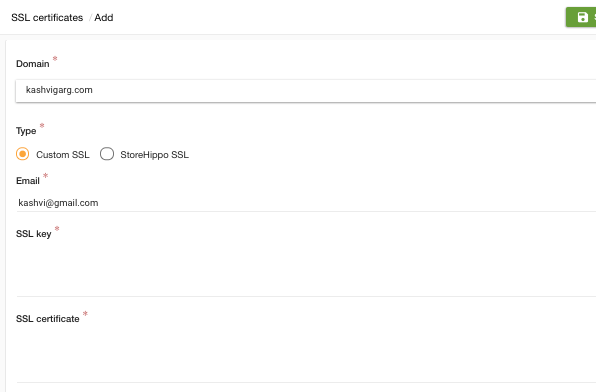 Before you add StoreHippo SSL, your domain must be pointing to your store on StoreHippo. When your StoreHippo SSL expires, the renew command will be executed automatically. You have to buy this from any SSL provider like Godaddy, Bigrock etc. Provide the SSL key and SSL certificate in the respective fields that you received from your SSL provider. Your SSL provider might need CSR and Key files in order to generate the certificate. Refer to Generating CSR and Key files for details. The key which you used to get the SSL certificate from the SSL provider has to be provided in the SSL Key field. Any other key will not work in favour of applying SSL certificate and your SSL certificate will not activate. Enter the email id that the domain is registered within the email field. Please note that only two attempts are allowed to add SSL certificate. If not successful, you can try more after 72 hours.